The Grass Family consists of 164 panels which were the result of Holup's 1999 commision by the New York Department of Transporation to create a large-scale public art piece for the Brookly-Queens Expressway (BQE). Holup created Common Ground, a monumental granite scupture covering the expanse of the BQE underpass. It was through the process of transforming original drawings to granite for Common Ground that Holup began experimenting with digital imaging. 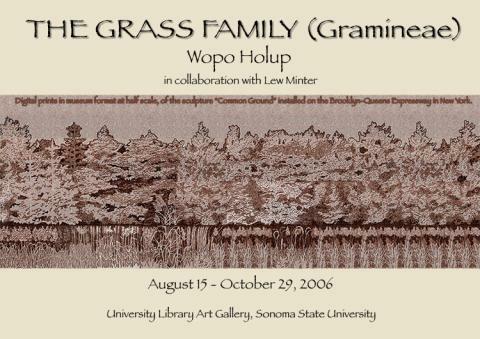 Her experimentation resulted in the creation of a second art piece, The Grass Family (Gramineae), which in on display in the University Library Art Gallery.